This blog series provides readers with insight on the valuable content that is being shared at the Career Clusters Â® Institute. Guest bloggers are among teachers, faculty, researchers and other experts that will present at the national gathering in Fort Worth, TX in June. Todayâ€™s guest blogger is Randy Swann, Education Administrator, Alabama State Department of Education. 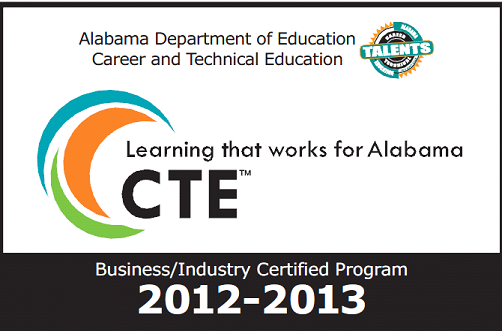 The Alabama State Department of Education, Office of Career and Technical Education/Workforce Development partnered with business and industry to develop a certification process that establishes and maintains a quality-oriented accountability system for the improvement and enhancement of Career Technical Education (CTE). All CTE programs must participate in an annual local evaluation for business/industry certification (BIC). BIC promotes program improvement that enhances the preparedness of Alabamaâ€™s students for society and tomorrowâ€™s workforce. Alabama requires all CTE programs to certify to industry standards, either through the stateâ€™s BIC process or through a national certification process. The BIC process is certified to standards as developed by the International Organization for Standardization (â€œISOâ€) and these standards are referred to as ISO 9001:2000 certification. The ISO 9001:2000 certification is process-based and recognizes organizations that link business objectives with operating effectiveness. ISO indicates that CTE demonstrates effective implementation of BIC documentation and records management; has the commitment of top management to local career and technical programs; has established clear policies; conducts good planning and implementation; performs good resource management; and has efficient process control, measurement, and analysis. The ISO certification ensures that the BIC process is quality-oriented, consistently administered, and focused on customer satisfaction. The purpose of BIC is to ensure that CTE programs meet industry standards so that students will be equipped for postsecondary education, apprenticeship, employment, and life. For more information, pleaseÂ go to Alabama’s Department of Education Web site. Randyâ€™s breakout session is Tuesday, June 11, 2013 in Session E, 1:30 p.m. â€“ 2:30 p.m. This entry was posted on Thursday, May 30th, 2013 at 4:49 pm	and is filed under Career ClustersÂ®, National Career Clusters Institute. You can follow any responses to this entry through the RSS 2.0 feed. Both comments and pings are currently closed.